Awarded the No. 4 seed in the college football playoffs, Washington (12-1) will face Alabama (13-0) in the national semifinals. The Cougars will meet Minnesota in the Holiday Bowl Dec. 27. Washington overcame the nation’s second-worst strength of schedule (127th out of 128 FBS teams) and was awarded the No. 4 seed in the college football playoffs Sunday, edging No. 5 Penn State in a vote by a selection committee. The Huskies will face No. 1 seed and defending national champion Alabama Dec. 31 at the Peach Bowl in Atlanta. “We looked at two conference championship teams. We looked at one-loss Washington against two-loss Penn State,” said Kirby Hocutt, athletic director at Texas Christian who chairs the CPF selection committee. “We talked about strength of schedule. We looked at both teams over 13 games. We considered a variety of metrics. “As we looked at those key statistics from an offensive standpoint, from a defensive standpoint, from a starting field position differential, the edge was to Washington. You look at turnover margin. Washington ranks first in the country in turnover margin compared to Penn State, ranking 50th. We spent considerable time talking statistical data. For me, the statistical data represents what’s happening on the field each and every week. 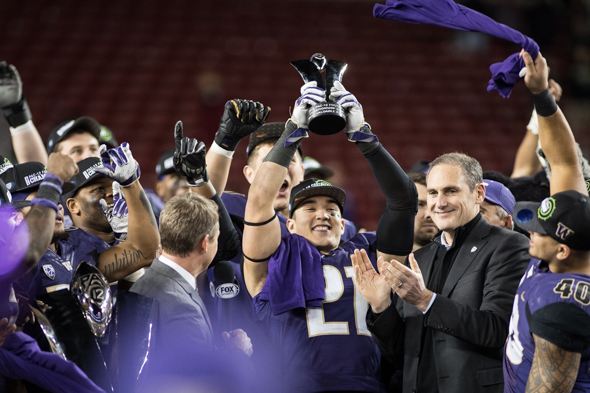 The Huskies (12-1) won the Pac-12 championship Friday night, beating No. 8 Colorado by 31 points. The No. 7 Nittany Lions roared back Saturday night from a 21-point deficit to win the Big Ten title against No. 6 Wisconsin. Penn State had a head-to-head win against Ohio State, but a 39-point loss to Michigan. Almost as soon as the committee slotted the Huskies into the No. 4 seed, oddsmakers installed them as a 14-point underdogs to the Crimson (13-0), the SEC winner and defending national champion. Clemson, by winning the ACC Saturday night, jumped to No. 2 and will play No. 3 Ohio State in the other national semifinal, slated for the Fiesta Bowl in Tempe, AZ., Dec. 31. The Alabama-Washington winner will face the Clemson-Ohio State winner Feb. 9 at Raymond James Stadium in Tampa for the national championship. “We couldn’t be more pleased, and I mean that,” said UW coach Chris Petersen. “That’s an obvious statement but I know how hard it is to get where we are in terms of how well you’ve got to play, and our kids have played really, really well. “You’ve got to have luck along the way and have the ball bounce your way. So we’re just really thankful and grateful for this opportunity. I think it’s awesome for the school. I think it’s awesome for Seattle and I think it’s awesome for our guys. It was a little nerve-wracking. Petersen was asked if he had seen the sign at Husky Stadium during the season-opening game against Rutgers that said, “We Want Bama!” The sign had wide circulation on the internet last week. Alabama and Washington faced one common opponent this year. The Tide trampled USC 52-6 Sept. 3 and the Huskies had their only loss to the Trojans, 26-13, Nov. 12. By the time of USC’s win over Washington, the Trojans had improved dramatically behind freshman QB Sam Darnold. Following that loss, Washington thumped its final three opponents by an average of 44-15. During an after teleconference, Saban was asked if he was surprised that Washington made the Final Four. Alabama leads the all-time series with Washington 4-0 dating to 1926. They have twice met on a neutral field, including the most recent meeting in El Paso, TX., in the 1986 Sun Bowl. Aside from Washington, four Pac-12 schools landed in the committee’s final top 25 rankings: No. 9 USC, No. 10 Colorado, No. 18 Utah and No. 19 Stanford. The Huskies also remained at No. 4 in the Associated Press top 25 rankings released Sunday. Dec. 27 Holiday San Diego ESPN 4 p.m. Minnesota vs. Wash. St. They had the second to worst non conference schedule. You cannot play on the PAC12 and have the second worst strength of schedule. Amen. Your comment should not only be listed first in the comments section, but should be placed ABOVE the first paragraph of this article. Haha. Gotta watch that Kent State! There is a typo in the article. The National Championship game is January 9th, not February 9th. The best thing about facing Bama is they have a very average, frosh QB in Hurts, whose line is: #34 passing efficiency @ 146, 22 TD’s, 9 Ints. Browning: #5, 176, 42, 7. If Jake wakes up from his nightmare state of the past 4 games and plays like he did the first nine, we will be good. If not, TV’s throughout the NW will be turned off by halftime. Hate to put it all on a sophomore, but that’s the reality, as Bama will eliminate the running game if there is not a credible, effective passing game. For starters, he needs to accurately throw long passes, not the weak-asx ones he’s been under throwing, like all of last year, so as to loosen up Bama’s vaunted defense. Pettis, Ross and McClatcher have to be LED, as they WILL be open, past this secondary. Unfortunately also, Kiffin is a MUCH better OC than Smith, so their play calling will exceed anything Smith can figure out. So true. On that fluke touchdown to Ross, that is a pick 6 the other direction against a team like Alabama. So one question is does he have the arm strength. Then the follow up question would be, if he does not, then why was he throwing that ball in that manner. In any case, congrats to the team, should be an exciting 3 weeks. Too many errors in this article. Good that somebody clarified that the weak part of the Huskies’ schedule were the three non-conference games, not the schedule as a whole. It is also worth noting that only two of the three non-conference games can truly be classified as deliberate acts of cowardice. Rutgers is a Big Ten school that was also crushed by the Huskies’ main CPF competitors, Michigan and Penn State. So in the bigger picture Rutgers was simply a wash.